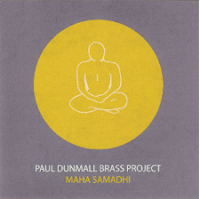 There are no clips of Dunmall’s Brass Project, so here’s some footage of him with Mark Sanders (drums) and Alan Niblock (double bass), a trio which so far as I’m aware has never recorded. An excellent week on an important musician. Thanks to all the reviewers who did a wonderful job, there's been a lot of outstanding writing. It gave me a much better understanding of Mr Dunmall's music. After the Leandre week this is another great achievement. It sent me back to the album, which I bought as soon as I was aware of it, to listen anew. I often find that Dunmall's albums with larger ensembles have a greater depth and staying power than the trios which are invariably a great listen nonetheless. In the larger works I think Dunmall's sheer musicality comes shining through both through written, like Maha Samadhi or spontaneously composed works, like Mumuksuta. I do think that his desire to catalogue his work with such a huge number of recordings may have something to do with not being better known. It can seem a daunting step into such a catalogue and a potentially expensive task to get a grasp on the sheer range of his work. I'd encourage people just to dive in somewhere and go from there - the rewards are waiting. Great review and excellent closure of an interesting week of articles. Dunmall was a little under-exposed in our reviews over the years, so this was a good catch-up exercise.